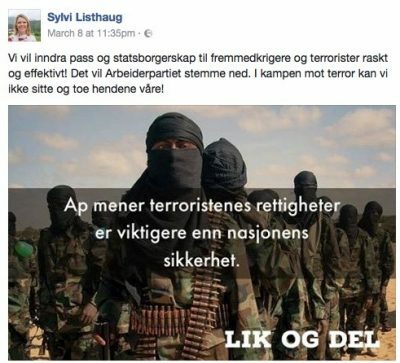 UPDATED: Justice Minister Sylvi Listhaug, under pressure to apologize for claiming on Facebook that Norway’s Labour Party puts terrorists’ rights above national security, has finally published a response after days of refusing to comment. She also finally deleted the post many found so offensive, but refused to admit defeat even after her initial response stirred even more anger. Listhaug, who’s part of the far-right faction of Norway’s conservative Progress Party, also continued to face calls to resign her prestigious ministerial post. Pressure was also growing on the Conservatives’ Prime Minister Erna Solberg to fire Listhaug, while both Solberg and Listhaug have been challenged to address Parliament and face the questions and criticism Listhaug’s post has raised. On Wednesday it also emerged that the veteran administrative leader of the Justice Ministry, Tor Saglie, had submitted a formal request to resign before his term expires. Saglie, who’ll turn 70 in September 2019, claimed he wanted to only work with “professional issues” during his remaining months on the job. Listhaug’s Facebook post late last week has set off a national uproar and stirred the most serious criticism against Solberg’s conservative minority coalition government yet. The criticism continues to come not only from opposition leaders in Parliament but also from within both Solberg’s Conservative Party, the government itself and the general public, not least the survivors of a right-wing extremist’s terrorist attack on the Labour Party and Labour government on July 22, 2011. Listhaug’s claim in her Facebook post, pasted over a photo of armed and masked terrorists, was too much for them to bear. Another wrote “Too little too late Sylvi,” in English, and suggested her response “smelled of instructions” from higher-ups. “I strongly doubt you have learned anything about how dangerous your methods are in appealing to the darkest corners of humanity,” he added There were repeated calls for her to delete the offensive post from last week, along with questions as to why she hadn’t already. 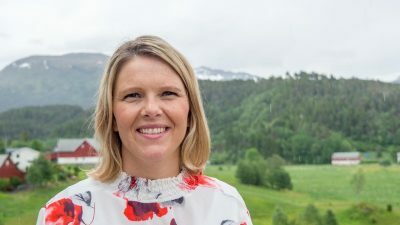 At around 12:30pm on Wednesday, Listhaug posted a new message on her Facebook page: “I have now deleted the post and photo that were published on Friday. The reason is that those who have rights to the photo in Norway have given us the message that it can’t be used for political expression. We must of course go along with that. I wish everyone a nice day forward.” She admitted no blame, defeat or regret. As justice minister, she was quickly assailed for having failed to check on photo usage rights, and for continuing to refuse to apologize. Listhaug’s government boss, Prime Minister Solberg, meanwhile, has accepted an invitation to meet with the national survivors’ group after the July 22 terror attacks, to try to soothe hurt feelings. Solberg continued to face questions over how she could justify having Listhaug as her justice minister. Solberg had criticized Listhaug’s post, saying it exceeded the limits of professional political debate, but Listhaug let it stand in defiance of Solberg’s remarks, until Wednesday afternoon.